Turmeric is an overall health tonic for protecting the liver, gallbladder and improving digestive functions, as it stimulates bile flow. It is a powerful anti-inflammatory and antioxidant. 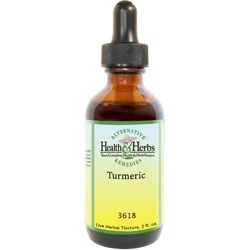 Turmeric has been used for the relief of aches and pains of sore joints, arthritis, and rheumatism. Recent studies have shown great promise in the treatment of malignant diseases, including those involving prostate, colon, esophagus, pancreas, and breast. Because Turmeric boosts the production of enzymes that digest sugar and fat, it is said to cut fat from the blood and may be helpful in weight loss regimens. Indian healers have used Turmeric for thousands of years in Ayurvedic medicine to control weight problems. For good digestion, Turmeric has a long and venerable history as a warming herb that stimulates the digestive tract. Its mild aromatic properties have been used for thousands of years to stop stomach irritation when not overused. It is also thought to stimulate the appetite and is sometimes used to treat anorexia. Turmeric is a potent non-steroidal anti-inflammatory that has been very beneficial in the treatment of rheumatism and arthritis. It is said to curtail inflammation of both osteoarthritis and rheumatoid arthritis and reduces swelling in recent bruises, wounds and insect bites. Also considered helpful for easing muscle pains and sports injuries, fibromyalgia, tendonitis, carpal tunnel, syndrome and bursitis. Turmeric is said to improve blood vessel health and stimulate the entire circulatory system. It helps to regulate blood pressure, thereby lessening a risk of heart attack. It is also thought to reduce tissue damage during an attack. Turmeric appears to lower serum cholesterol in the blood and to diminish platelet aggregation (blood clotting), which is helpful in cases of arteriosclerosis. It also enhances the respiratory system and is often used to relieve head colds, sinusitis and coughs, and ease chest congestion. Turmeric has helped ease the discomforts of women's monthly menstruation and regulate its flow. It has also been called a uterine stimulant and has been thought to be helpful in treating uterine problems. Said to stimulate the immune system, recent research claims that it appears to effectively fight free radicals. Turmeric is said to work well in conjunction with, and aid recovery after, chemotherapy drug and radiation treatments. Recent studies completed at Johns Hopkins have indicated that compounds in Turmeric (Curcumin) may, in fact, help prevent colon cancer. Also, in recent research studies have suggested that the herb has the ability to reduce the effects of Alzheimer’s disease. Data from the University of California indicated that using vitamin D in combination with Curcumin-Turmeric may help prevent and treat Alzheimer's disease because of its ability to boost the immune system and protect the brain against beta-amyloid accumulation. The 2009 research, which was published in the British Journal of Cancer, demonstrated that Curcumin, the active chemical in Turmeric can destroy gullet cancer cells, and the team indicated that this natural remedy started to kill cancer cells within twenty-four hours. Also, the cells began to digest themselves, after the Curcumin triggered lethal cell death signals, which opens up the possibility that natural chemicals found in Turmeric-Curcumin could be developed into new treatments for esophageal cancer and can benefit advanced pancreatic cancer sufferers. Turmeric is thought to accelerate the detoxification process in the whole body. It is an antiviral and fights viral infection. There is some indication that Turmeric may help to inhibit HIV infection from progressing to full-blown AIDS by acting as a protease inhibitor. It is considered an antibacterial and has been known to kill parasites, fight skin infection (acne) and improve the texture and smoothness of the skin. The herb is also said to possess antifungal properties, inhibiting yeast overgrowth. And finally, the herb appears to be an effective tonic that normalizes energy flow, enhances the immune system and improves overall good health. Turmeric's potent antibiotic qualities may be helpful in combatting MRSA (methicillin-resistant Staphylococcus aureaus), a particularly dangerous bacterium that may not respond to conventional pharmaceutical treatments. Ingredients: Turmeric Root, Structured Water, 20% Alcohol. Non-Alcohol: Turmeric Root, Structured Water, Vegetable Glycerin. Contraindications: Those taking blood thinners (Coumadin, etc.) should avoid Turmeric, as it may add to their anti-clotting effects. Overuse (more than the recommended dosage) is not recommended, as it may result in stomach distress. Normal therapeutic doses of Turmeric protect from ulcers, but at very high doses, it may induce ulcers. Turmeric is not recommended for persons with biliary tract obstruction, as the curcumin stimulates bile secretion. People with congestive heart failure, whose cause remains unidentified, should avoid this herb. Turmeric is not recommended for people with painful gallstones, obstructive jaundice, acute bilious colic or extremely toxic liver disorder. This is why it is very important to take only the recommended dose of this herbal remedy. Since Turmeric is considered a uterine stimulant, pregnant women should not use it. Turmeric is said to work best when taken on an empty stomach.